Galway Crystal hurricane lamp features cut Celtic knot-work. This Irish crystal hurricane lamp includes the pillar candle. This Irish crystal hurricane lamp features a cut Celtic knot-work motif. The Celtic hurricane lamp is a two piece design that consists of the pillar and the base; it measures 8 1/2" tall and is 5" wide at the rim. The Galway Crystal hurricane lamp is made of 24% leaded crystal; it is gift boxed with a Celtic knot history card, complements of The Irish Gift House. Galway Crystal hurricane lamp is enhanced with deep cuts along with an etched Trinity knot. Galway Crystal hurricane lamp features a verse from the Irish blessing along with etched shamrocks. 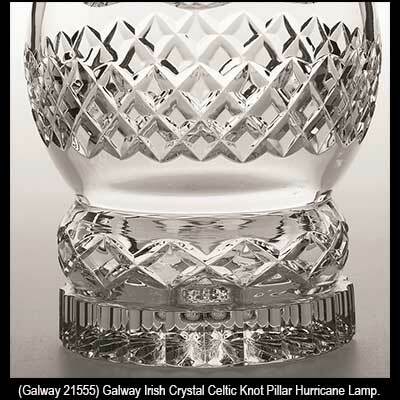 Galway Crystal hurricane lamp is cut in the enduring Longford pattern. 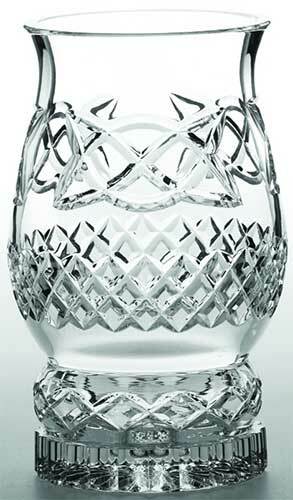 Galway Crystal hurricane lamp is enhanced with deep cuts along with an etched Claddagh.